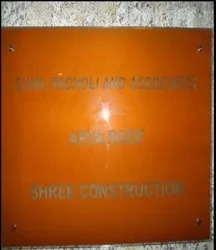 Rooftec Infrastructure Private Limited formerly known as Shree Construction, is incorporated in the year 1998. Marketing Experience has strengthened our belife to quality products. 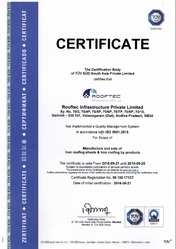 After establishing name in the filed of industrial roofing solutions now with the aim Rooftec Infrastructure Private Limited is established. Taking into consideration the demand of quality product company decided to manufacture hi rib profile sheets, metal deck sheet, accessories and many more. Thus the company set up the manufacturing plant to make roofing solutions at Garividi Vizianagaram (A.P.). 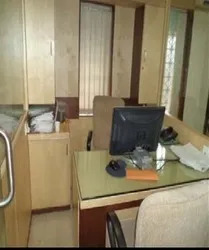 These products are available in various specifications and customized as per the requirements of the customers. Being a quality assured company we provide superior quality products to our clients. This unit is managed by a team of quality analysts who conduct various tests on the products based on various parameters like efficiency, durability, utility, optimum performance and reliability. The entire product range also gets thoroughly tested after their procurement from our dealers. Owing to our rigorous quality practices, we have gained a reputable name in the industry. We also provide hygienic packaging of products that ensures their quality and efficiency. To offer holistic services to our loyal client base we have formed our enterprises each equipped to serve client in most inclusive manner. We also procure products from the certified dealers who use best grade raw materials to ensure that our products provide satisfactory performance to our clients. Our clients are very much satisfied by our quality products and based on their satisfaction our clientele is increased. Our achievement in the domain as service providers is mainly due to the cooperation we have received from our vendors. We select our vendors on the premise of the quality parameters they follow in the manufacturing process. We have a team of experts to select the vendors in the industry. We source our range of Roofing & Cladding Sheets, Roofing Sheet Accessories and Ventilators from most trusted vendors in the industry who have` made a reputation for honesty, high product quality and on time delivery. Bharat Heavy Electricals Limited BHOPAL. METCON INDIA REALTY INFRASTRUCTURE PVT LTD.
Steel Authority of India (SAIL) Reliance Infrastructure Ltd GMR Infrastructure Ltd Gannon Dunkerley&Co. Ltd Raymond Ltd. NTPC Ltd.
Khare &Tarkunde Infrastructure Pvt. Ltd.
Shree Khedut Shakari Khand Udyoug Mandli Ltd.